Reflecting the love of God by bringing the gift of mobility and dignity to those in developing countries who are unable to walk. Our Mobility Cart (PET®) is a three-wheeled, off-road wheelchair, operated by hand power. Built by a faith-based, non-profit, volunteer organization, mobility carts are delivered at no cost to people in developing countries who have lost the use of their legs. helps lift crawling people up out of the dirt. Amazon Smile all the time!! 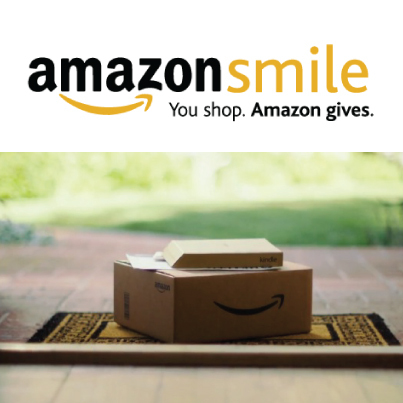 Remember to shop at AmazonSmile when you do your online shopping year round. If you are not already registered, go to www.smile.amazon.com and log in just like you do with you regular Amazon account. At the top of the page click on 'Supporting:'. Search for 'Personal Energy Transportation of Austin'. Every quarter PET-Austin get .05% of our supporters purchases from the AmazonSmile Foundation. PET International is an authorized charity for the annual Combined Federal Campaign (CFC). The CFC is similar to the United Way in that all US Governmental employees (civilian and military, current or retired) can easily make contributions designated to specific charities or shared across all charities listed in the CFC. Please forward this news to your Federal Governmental friends and ask they consider designating PET International (CFC #38749) as one of their charities of choice. Two weeks ago, we shipped 42 PET® carts to the Orphan Grain Train organization to be included in shipments that they send around the world. We are so thankful for partners like this that help us share the "Gift of Mobility." Believe in your heart that you’re meant to live a life full of passion, purpose and miracles regardless of your disability. 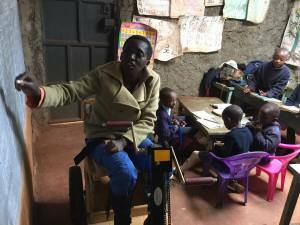 This is the guiding principle of Paula Rono a teacher and a beneficiary of a mobility cart donated by Partners For Care. Paula testifies, “my life is no longer the same because my mobility has improved. 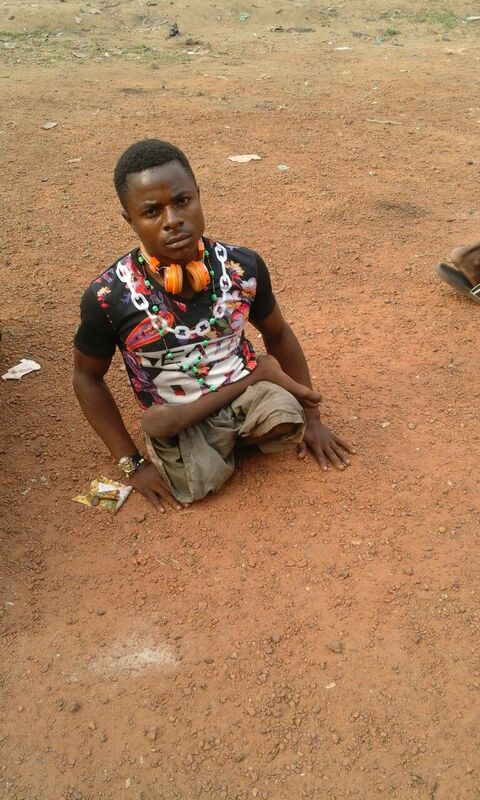 “I can move from class to class and teach comfortably seated on my mobility cart thanks to Partners For Care and Mobility Worldwide “. This mother and daughter live in Malawi and at the young age of 3, Chrissy, one of her children, contracted polio; her life was spared, but her legs were not. 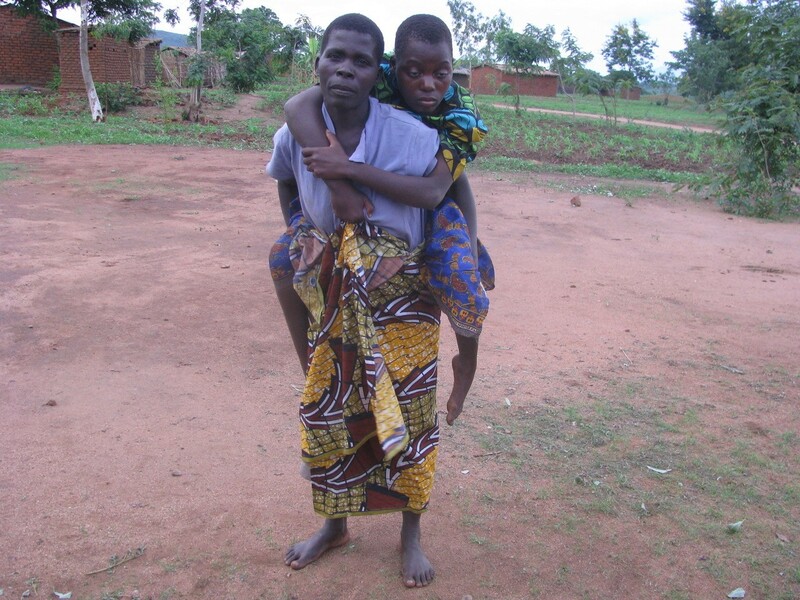 For 19 years, this mother carried her daughter, Chrissy, on her back--everywhere! As Chrissy grew older, the problem of getting her from place to place became more and more difficult. "She is heavy!" her mother explained, "it has been a hard experience and it is very tiresome on my back. I must carry her everyday." Then one life changing day, her mother carried Chrissy to a place that would change both of their lives: Wilson Tembo with the Malawi Project fitted Chrissy into a Mobility Cart made in Wheatfield, Indiana. "Now I will be able to get her to and from church very easily," her mother said. And for the very first time, at the age of 22, her mother walked back to their village with Chrissy--but this time, they were side by side! of this unit will help her mother attend to other important matters because she no longer has to carry Chrissy on her back all the time. 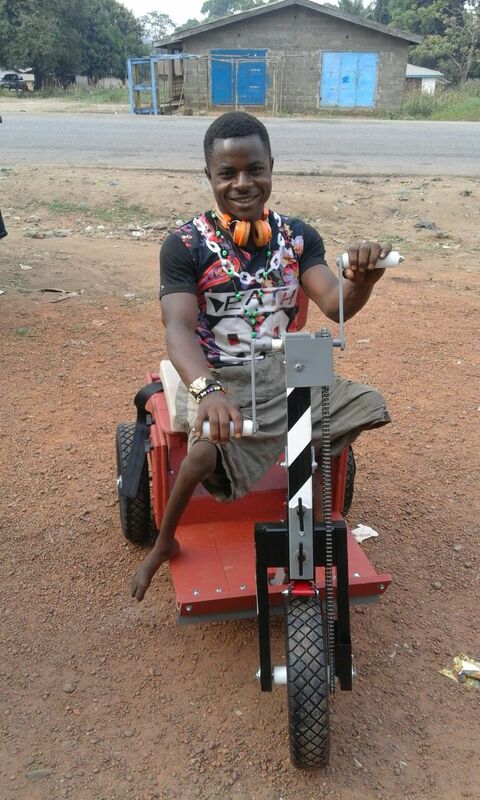 This is one of the carts that was part of the Mobility Worldwide, TX-Austin shipment to Sierra Leone. Another life changed. The following note came with these photos. "Thank you again for this collaboration which has changed young lives in Foredugu and Bonthe, Sierra Leone. Sierra Leone Education and Development Trust"
PET-Austin had a great 2015. By the end of December we constructed 98 PET carts. 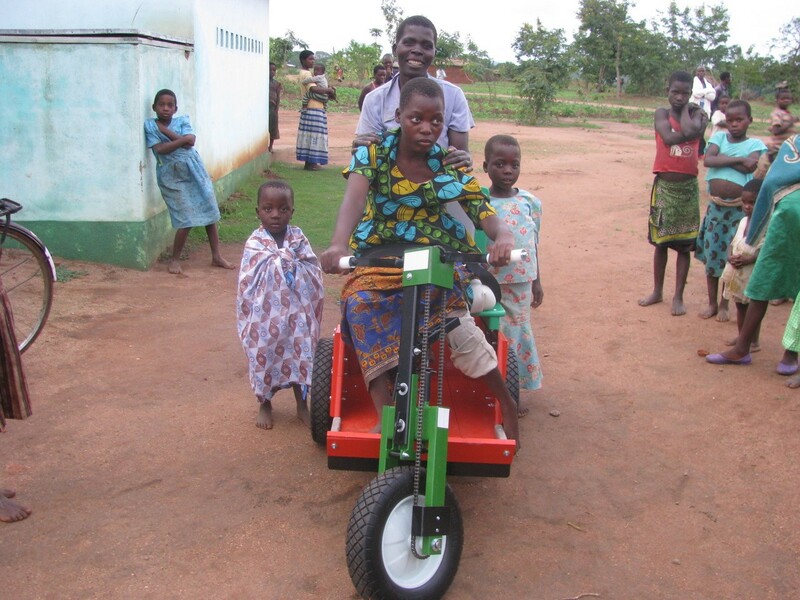 We sent 9 carts to PET-Penney Farms to be included in a shipment to Sierra Leone. With the help of PET-San Antonio, PET- Brazos Valley, PET-Memphis and PET-Columbia we sent a container of 155 PET carts to Guinea Bissau. We also started a relationship with Mission of Hope Haiti and sent 2 PET carts with them in December. From a donation standpoint, we started the year getting ready for the Amplify Austin Giving campaign. On the 'Day of Giving' we received over $9500.00. Bethany United Methodist Church participated in the eighth annual "Lenten Challenge" and the congregation donated the funds to build 40 PET carts, one for each day of Lent. With these and additional gifts and memorials, we received almost $50,000 into our operating budget and added almost $35,000 to our capital building fund. Our volunteers at the PET-TyRex shop participated in the Round Rock 4th of July Parade and had a great time. We also were the featured charity at the Round Rock Express ball game on July 5th. The real big event for us was hosting the Annual PET Conference. We would like to offer a big thank you to Bethany United Methodist Church for allowing us to utilize the church facility for this 3 day event in September. Over 75 people representing 15 of the 21 US PET shops, the PET-Zambia shop and many of our distribution partners were in attendance. The president of the National United Methodist Men's Organization was also present to report on their official partnership with PET-International. Overall PET in general and PET-Austin specifically has been blessed and we are looking forward to an even greater 2016. Love the Round Rock Express and PET too. On July 5, PET will be the Chasco featured charity at the Round Rock Express game. We will be featured in the Chasco Community Partners kiosk in front of the main gate. 4. Select the number of tickets you want and follow the instructions to complete your order. Be sure and come by and see us and bring a friend, especially one that doesn't know about PET. See you at the game!!! Click the logo to go to the store. Help give the Gift of Mobility to someone in need! Check out our new menu item "News". There you will find news about our shop as well as the latest copy of the PET International Mini-Newsletter.